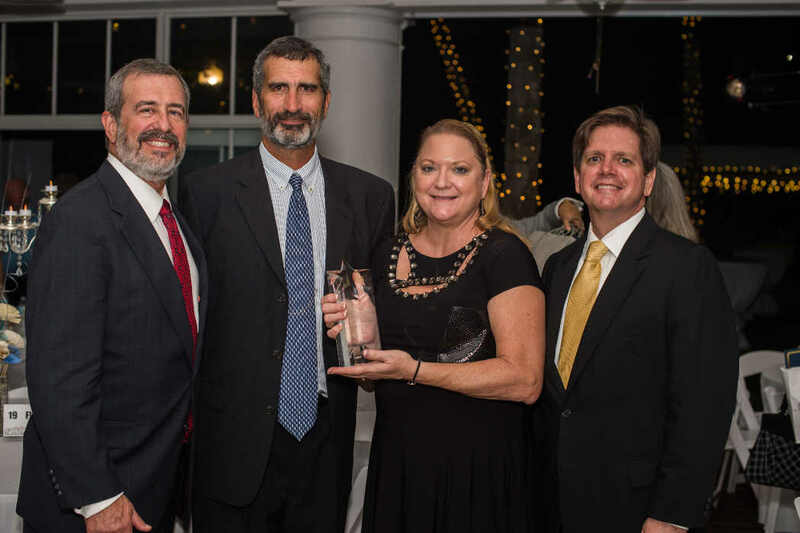 FORT MYERS, Fla. - Nov. 10, 2018 - PRLog -- PBS Contractors of Naples, Florida received the 2018 Business Ethics Award from the Uncommon Friends Foundation at its annual Uncommon Evening gala held Thursday, November 8 at the Burroughs Home & Gardens on the Fort Myers riverfront. PBS Contractors is a luxury residential and commercial builder and remodeler serving South Lee and Collier Counties and was represented by Russell Budd, CEO/Owner, Bart Zino, Kimberly Ortegon, and Mark Simmons. Brian Rist, President and CEO of title sponsor Storm Smart, presented the award to PBS Contractors before an audience of business, education and community leaders and student scholarship winners. Other finalists in attendance were Chris-Tel Construction of Fort Myers, represented by President Howard L. Wheeler II and Priority Marketing of Fort Myers, represented by President/Creative Director Teri Hansen, APR. Known as a concierge builder that puts people before profits, PBS Contractors has been on a mission since its founding in 1986 to build better lives for its team, its clients, and its community. At the cornerstone of PBS are 28 guiding principles that it refers to as, "The PBS Way." Rather than defining corporate values, they instead define fundamental behaviors that, in turn, guide the day-to-day ethical actions and choices of their 35 employees. For example, Fundamental #2 is, "Do the right thing. Always." and Fundamental #5 is "Honor Commitments." Everyone at PBS Contractors, from entry level to senior management, lives and practices the 28 fundamentals daily to guide decisions and actions, resulting in extraordinary customer satisfaction and superior structures. For more information, visit www.pbscontractors.com or call (239) 643-6527. Rachel Mas was named the 2018 Character Education Teacher of the Year. She is an educator at Cypress Lake Middle School, where she teaches Spanish and Intensive Reading. She holds a BA in Education from Florida SouthWest College (2009), has served in the United States Army for 15 years, and is currently an Army Reservist in Cape Coral, Florida, serving as her unit's Equal Opportunity Representative and UPL chairperson. She believes character education is just as important as students' core disciplines in their overall education and development. Gray Davis was given a Lifetime Achievement Award for his many years of service to the Uncommon Friends Foundation, including serving seven years as chairman of the board of directors (2008 to 2015). Davis is Agency Executive/Senior Vice President of McGriff Insurance Services, a member of BB&T Holdings, the fifth largest independent insurance agency in the United States and the world. He was instrumental in raising donations to build the Gale McBride Pavilion in 2015 and also in establishing the Hilliard Student Scholarships to Florida Gulf Coast University. He holds an MBA in finance from Walden University and an Executive MBA from Babson College and is a veteran of the United States Navy and a retired member of the United States Marine Corps. Board Chair Marilyn Stout recognized past board members Brenda Stewart and Jody VanCooney for more than 20 years each of invaluable volunteer service to Uncommon Friends Foundation on the scholarships program, public relations, and events committees, always giving a helping hand where needed. Caryn Smith, CEO of Driven by Design Marketing & Publishing, chaired the 25th anniversary event. Title sponsor was Storm Smart; other major sponsors were Conditioned Air, Florida Weekly, Home-Tech, Inc., Edison National Bank, Kiwanis of Cape Coral, and The News-Press Media Group. The nonprofit Uncommon Friends Foundation, celebrating its 25th anniversary in 2018, is dedicated to lifelong character building among today's youth and business leaders. It strives to inspire future leaders toward excellence of character, a spirit of innovation, and a sense of purpose. Through character education, business ethics programs, scholarships, and historic preservation of the Burroughs property, the Foundation carries on the generational values of Fort Myers businessman Jim Newton and his friends Thomas Edison, Henry Ford, Harvey Firestone, Dr. Alexis Carrel, and Charles Lindburgh. For more information, visit https://uncommonfriends.org/ or contact Executive Director Jennifer Nelson at 239-337-9305.